Lots and lots of flowers are opening up. Every day more of them. Once the daylight shifts they just start appearing in a great rush. So let's start where the blooms are pretty well set, which is in the orchard. 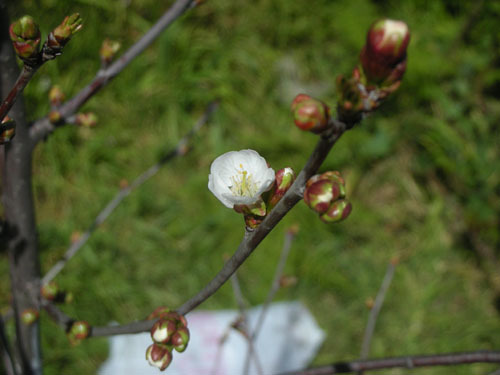 We have blossoms starting to appear on the apples; this is Summer Rambo, one of the new trees this year. 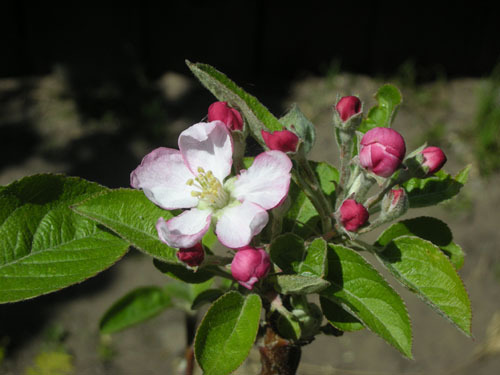 I love how apple blossoms are like little analogs of the fruit: white inside and dark pink on the outside when furled. We also have lots and lots and lots of cherry blossoms (which may or may not translate to lots and lots and lots of cherries this summer). 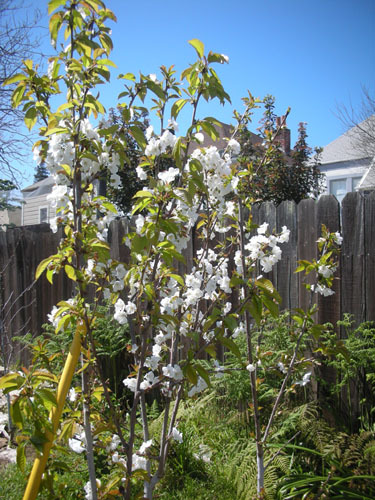 Cherry blossoms are, of course, on little stems like the fruit will be, so they wave with a certain amount of exuberance in the afternoon wind. Also, the sour cherry (Montmorency) has buds. Last year birds ate all of them, the little jerks. This year: a net. And not a fruit tree but in the orchard is the lilac, which is opening out and being all lilacy. The scent is not as strong as the lilacs of my youth, but it is acceptable. 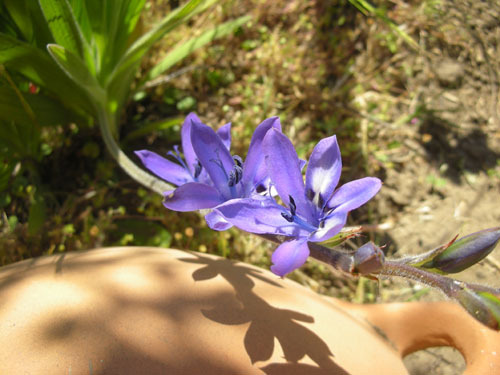 And in the pretty blue flowers category (I was noticing this afternoon that I have a lot of blue, bell-shaped flowers around), the blue Babiana is blooming. E-mail yesterday from a friend: "How are the plants liking all that water?" They are liking it a LOT. 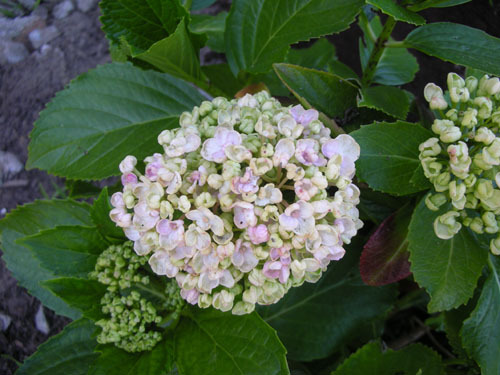 The hydrangeas, which usually struggle in our really dry summers, are going nuts because I've been watering them almost every day. It really is a lot of water. We just have a few minor kinks to work out of the system (tonight we're making our first run at letting the tank stay connected overnight because Noel got the automatic pump activator working). In the meantime, we have pretty snowballs on the hydrangeas, and lush foliage that is managing to keep up with the snails. 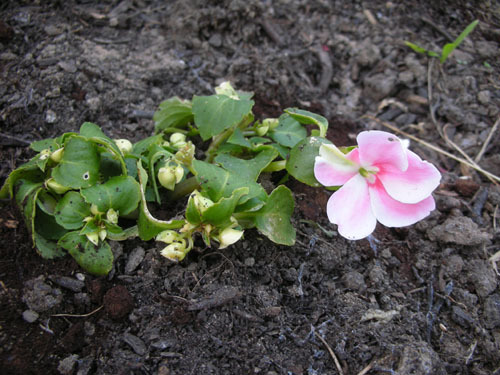 In the same bed, the impatiens are mostly doing well, too. A few have really been munched, which irritates me. And makes me wish chickens would stay awake after dark so I could stake one out by the beds that get the worst of it. 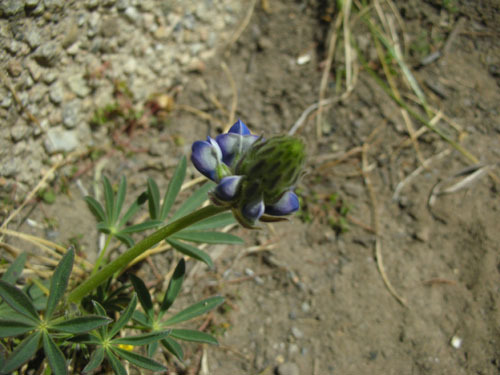 In the native plants world, we have the emergence of the first lupine of spring. These are self-sown around the rainwater basin, and I let them go because they're not nearly ready to be pests. 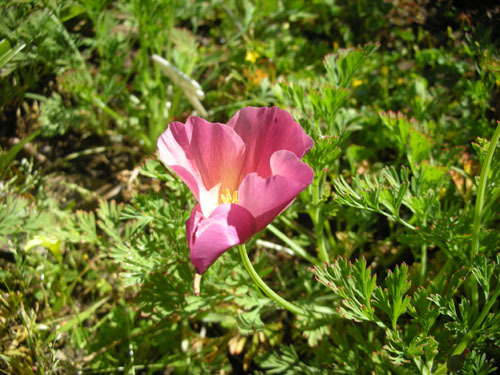 Also, the various colours of California poppy are interbreeding. 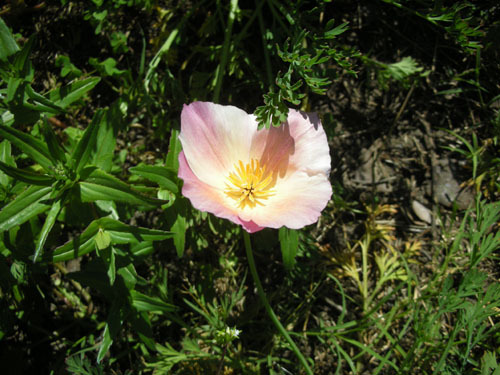 Most people know the state flower, the bright orange poppy, but they do come in all kinds of shades. This one is one I planted, I don't remember the name. 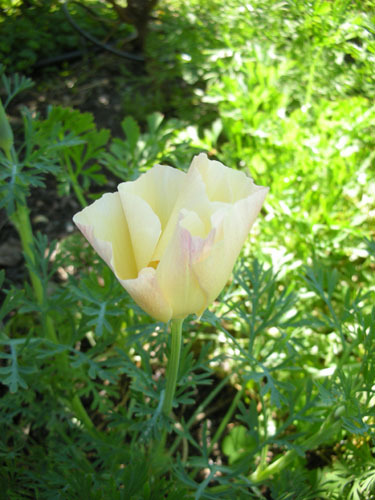 And this is one of the weird hybrids, made when the previous poppy interbred with the white ones. All sorts of streaky pink and white. One of the original white ones. 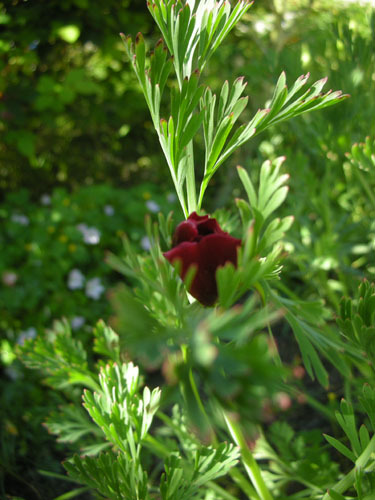 And out of nowhere, what looks like a deep red poppy. I've never seen one this colour, so it will be interesting when it opens (the colour looks much lighter open, usually). I think this one is from some seeds I scattered that were in a mix. 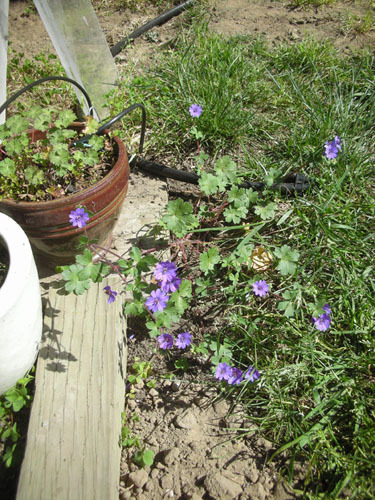 Other scattered seeds (not by me): the Geranium Bill Wallis has sown itself in the ground near its pot. I may just plant the original plant in the ground there and put something else in the pot this year; I'm being kind of ambivalent about doing containers right now. And my current problem: I planted the citrus together in high-intensity configuration, and it turns out they don't much care for that. I'm thinking I need to dig them out and move them elsewhere in the yard, but where? I'm so envious you are in the yard during the week! The garden looks beautiful. I have two citrus 10' apart and I was thinking of putting in a lime between them. All are dwarf flying dragon rootstock. How close were your citrus that you want to separate. Oh, and the chickens will find all the slugs and snails in their daytime hiding places. (Or so I'm told, as my chicks are only 4 weeks old and still in the dining room). You should talk to Jill Zurschmeide. Her chickens wound up in the stewpot because of the wreckage in the vegetable garden. So, the chickens might not be a magic bullet (pullet?) for your garden woes. I'm going to be keeping the chickens penned up most of the time to prevent just that carnage. But the snails are making me very angry. CJ, the citrus are about 18" apart. 5' apart should be fine (I'm thinking about relocating mine to about 4' apart). Your garden is magnificent! Makes ME feel like a slug! Did you consider at any time espalier for the apple trees? I am considering this for my backyard. If (and when) I do, I'll buy the trees from Trees of Antiquity as you did. There are only a few apple trees that will do well here in SoCal, i.e. Anna, Beverly Hills, etc. I'm hopeful for January 2009. I want to work the soil well this year before I put in any tree. I've already killed a couple of citrus trees. Our soil is extremely alkaline! Snails. Yes. Well. I think I live in the snail capital of the world. I've tried numerous organic fixes that don't. Hand picking? Don't even go there with me. I hate those things!! I've heard ducks are good w/snails, but we are not zoned for such critters. I love the idea of chickens AND bees !! Very,very kul!! :-) Can't wait for the pics! luv.m. Ah, yes, the nice volcanic soils of SoCal. At the place I lived in SLO, our orange tree died a horrible death, but actually the apple thrived (Fuji). But the owners didn't do any kind of amendment with compost or anything like that, so there you have it. That soil is like a poison for European plants. I never considered espaliers, which is probably my irrational prejudice about unnatural tree forms. Our neighbor put in a pair of columnar apples, which are pretty but really formal looking (even in their informal garden). 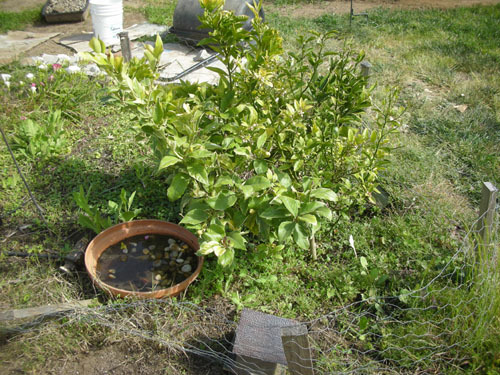 Try sprinkling diatomaceous earth on the leaves where slugs or snails are eating the plants. They ingest it and it kills them. (Tried it on my hostas and it worked just fine.) You can get it at swimming pool supply places or any "green" store. Good luck! Your garden makes me green with envy! I'm just starting to re-vamp our postage stamp of a yard, it's a labor of love for me. If you still want a lilac that's heavy on the old-fashioned scent, try Mme Lemoine(white) or Charles Joly(red). They would contrast nicely with your lavender one, and I believe most garden centers (and even Coscto!) carry them. Keep up the good work! Sarah, keep in mind that it was less than three years ago that our garden was a bare patch of dirt. Make a good structure and fill in around it, and everything else takes care of itself. 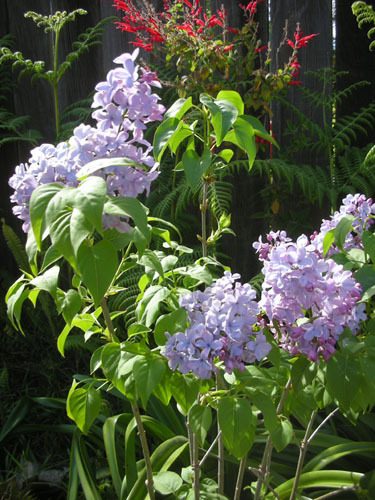 As for lilacs, our limiting factor is our chilling-hours, which may not be enough for most lilacs to do well. 'Blue Skies' is a lilac bred for hotter climates, so I'm seeing how well it does before trying out other ones. Also, I have three Buddleias, which bloom all summer and have a nice scent, as well.